Welcome to the third and final part of Biblical Alpha: Proverbs. (Part 1 , Part 2, and Part 3). We will cap off the series with the passage on the Woman who Fears the Lord from Proverbs 31:10-31. Also known as the Proverbs 31 women, this passage is the standard many in evangelical and other Christian circles measure womanhood by. It is a standard some Christian women like to rebel against and one many Christian women think they fall short of, but try to attain. Any patriarch-to-be should examine this woman carefully. Make sure any potential woman you plan to marry matches what is written here, or at least is trying to. (This goes for anyone else planning to hitch themselves to a woman, not just patriarchs). A wife of good character is one of the greatest gifts a man can have. If you marry, make sure you marry a wife of good character. A good wife is trustworthy. If you can’t trust a woman, don’t marry her. A good wife will seek the good for her husband. She will not try to hurt you. Marry a women who wants to to good by you, not a women who demands and criticizes (or worse). A good wife works hard. Marry a women who is active and productive, not lazy. Do not marry a woman who’s spoiled or unwilling to get her hands dirty. A good wife prepares food for her family and makes sure they are fed right. Marry a woman who likes to cook. Do not marry a women who refuses to cook because it’s sexist. A good wife can take be trusted to care of finances and handle her wealth properly. Marry a woman who can follow a budget. Do not marry a wasteful spendthrift or a women who likes wracking up consumer debt. A good wife is strong. Marry a woman who can take care of herself and won’t be utterly helpless without you. Do not marry a delicate flower, a weak women, a dependent women, or someone unwilling take care of themselves. (Hint: Do not confuse being strong with being bitchy or a ball-buster as some feminists are wont to). A good wife is productive and industrious. Marry a women who is willing to work hard, do not marry one who is lazy. A good wife is compassionate, charitable, and generous. Marry a woman who cares about the people around her, do not marry a woman who thinks only of herself. A good wife will make sure her family, herself, and her home are kept well and look presentable. Look for a wife who will value and create beauty in herself, her family, her home, and you. (Hint: Valuing beauty is not the same as vanity and superficiality). Marry a woman who takes care of herself and her home, do not marry a disorganized mess. A good wife is one who will bring you respect among your peers and your betters. Marry a woman you are proud to show off to your friends, your church, your family, and you boss. Do not marry a woman you would be embarrassed to bring to an office party or family dinner. A reiteration; a good wife is productive, industrious, and financially astute. A good wife is dignified, but has a sense of humour. Marry a respectable women with an easygoing, joyful temperament. Do not marry a coarse or “low-class” woman or a women who feigns dignity through being stuck-up, prissy, or a stick-in-the-mud. A good wife is wise and speaks kindly. Marry a woman whose judgment you respect and who talks kindly to you and others. Do not marry a stupid, foolish, or rude woman. Another re-iteration; a good wife takes care of her family and isn’t lazy. A good wife will bring joy to you and your children. Choose one that will. Choose a good mother for your children. Do not marry a woman that will bring pain or sorrow to you or your children. Beauty fades. Choose a wife who has good character; do not fall into the trap of marrying a beautiful woman lacking character. Beauty is good, but character matters more in the long run. A good wife will let her good works speak for her; she will not be vain, boastful, or arrogant. Marry a humble woman who desires to do good and help those around her. Do not marry a selfish narcissist, an attention-whore, or an arrogant, vain, or snotty woman. The Proverbs portion of the Biblical Alpha series has been a bit different from the rest of the series; it has focused more on advice for men, than on Biblical teaching on masculine virtues, but I hope it’s been valuable to some of the readers. A major theme throughout, is choosing the right woman and avoiding destructive women. Hopefully, this will help patriarchs-to-be (or others looking for relationships with females) know more about the kind of woman they should look for, and the kind of women they should avoid. * All references from Proverbs, ESV version. Now for the third part of Biblical Alpha: Proverbs. (Part 1 and Part 2). The first few lines ending with “the way of a man with a virgin” made only limited sense to me, I thought it was positive at first. So I read some online commentary on it. Some took the last line as meaning a man who engages in fornication and deflowers an innocent virgin (a really big deal in Jewish society), but leaves no visible trace of sin (as the eagle, serpent, and ship leave no trace of their passage). Under this reading, it would show disapproval of fornication, at least with virgins. So, a no-no to playerdom. Others I read had viewed the line as something more innocent and wonderful. They compared young love and marriage to the natural wonders of the world. In that case, marry young, marry a virgin, it’s wonderful. Some connected it to the next few lines about the adulteress. Where the original four lines hide their traces, so to does the adulterous. In this case, beware, the virgin who says she’s a virgin may not be, and the women who plays innocent, may not be innocent. These warnings far precede those of the manosphere about women lying about their n-count. So, next time a women complains about you judging her for her number of sexual partners, tell her it’s in the Bible, Proverbs 13:19-20. I’m not sure which would be the best reading and can’t verify as I don’t know Hebrew, but they all seem to fit well with the rest of scripture, so they all seem valid. A combination of the first and third interpretation seemed to be the one most used by the older and mroe well-respected sources, so I’d lean to those. There is also is another warning against adulteresses. In other translations unloved comes out as bitter, odious, or hated. Avoid bitter and odious women. What are you doing, my son? What are you doing, son of my womb?What are you doing, son of my vows? A clear warning not to waste yourself on women. Give not thy strength unto women, unto strange women. He must not be soft and effeminate, nor spend that time in a vain conversation with the ladies which should be spent in getting knowledge and despatching business, nor employ that wit (which is the strength of the soul) in courting and complimenting them which he should employ about the affairs of his government. Having a good woman is excellent, but don’t waste the effort on women who aren’t worth it. Also, have a life beyond women, there are many more important and fruitful things to attend to. Tomorrow I will publish the fourth and final piece of our current looks at Proverbs. We will be looking at the exciting topic of the Proverbs 31 woman. Don’t miss it. Here is part two of our look at Proverbs for the Biblical Alpha series. This will be examining the section of shorter proverbs of the book. Choosing the wrong women, or letting her control your life is a nightmare. If nothing else sinks in, know that you have to be very careful choosing the women you allow into your life. Remember, beauty is nice, but it is not the only thing. Don’t let the wrong women control you with her looks and charm. So choose a good one. She will bring you honour and joy and she will build your house. Choose a wife for yourself that will do this. For women who might be reading this, be wise, build your home up, don’t tear it down. The wise man is confident; confidence is key. Preferably you’d gain it from God, but even if you’re not religious, gain it anyway. Arrogance and haughty pride will lead to your destruction. There is a difference between arrogance and confidence: the latter will build you up, the former will destroy you. Don’t boast, let others boast for you. Have enough honour that others will demonstrate fitness for you. Pre-selection is good. Keep your frame. A wise man does not allow others to control his emotional state. He remains in control of himself at all times. Control your frame. Demonstrate self-mastery. 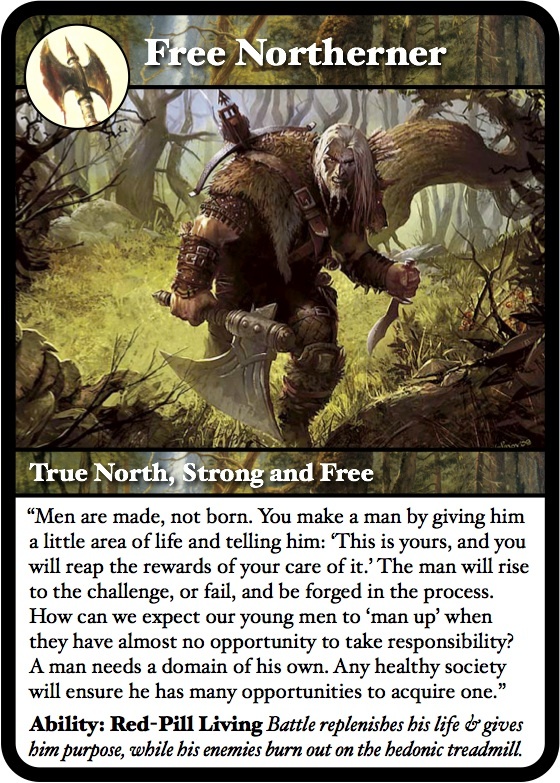 Young men, be strong for to gain honour. Be judicious and learn to be persuasive. Be judicious. Demonstrate wisdom, knowledge, and mastery over yourself. God would probably not approve overly much of night game though. A man does not hope, he takes action to fulfill his desire. A man does not slander or flatter. He should honest and straight-forward in his criticism. Men need to interact with other men to better themselves. This is what the manosphere exists for: for men to better themselves. Also, outside the manosphere, start your own gang so you can work to improve yourselves. * All references from Proverbs, ESV translation. The Book of Proverbs from the Bible is one of ancient wisdom written mostly in the form of simple proverbs (surprising, I know). The book is filled with instructions on attaining wisdom and avoiding evil and folly. So, as a continuation of the Biblical Alpha series, let’s take a look at it from a red pill perspective. The book starts with admonishments to pursue wisdom, follow God, and avoid evil so it will go well with you. These themes continue throughout the book. I will not be talking of them, instead I will mainly focus on those related to the theme at hand. I would still heavily recommend reading the entire book to anyone, as the cultural significance of Proverbs alone is more than enough reason to do so. Here, some common sense advice is given to avoid the adulteress and to be wary of women who would forsake their marriage vows. They will lead to death. Women are not inherently good and men who are not wary will suffer. Here we see it presented even more starkly. The wrong women will doom you. “Keep discretion” and “guard knowledge” are another way of saying ‘maintain your frame’. Do not allow yourself to be sucked into the charms of a woman against your better judgment and your principles. If you choose to pursue the “forbidden women” you will labour for others while groaning as your flesh is consumed. Does this not sound like the plaintive cries of an MRA whose women betrayed him? Be very careful of the women you give yourself to. Also, notice the instruction to love your beautiful wife. The Bible implies that you should choose a spouse that you find beautiful. Don’t fall for the “a godly man should love me for who I am inside” nonsense some will spew. Another admonition to avoid the adulteress. I think there might a theme here. Another warning about the “forbidden woman”. It is obvious at this point that any Christian leader arguing the natural goodness of women has never read Proverbs. It is also obvious that the Bible is very strong on letting young men know that the wrong type of women is destructive. As I’ve written before, be very judgmental when choosing a mate. At this point, Proverbs changes from longer form, almost poetic, admonitions to wisdom, to shorter and simpler proverbs. This post is already long enough, so I’ll leave it there, but Part 2 should be forthcoming soon. Returning briefly to my Biblical Alpha series, today we will look at Boaz, who became the forefather of both King David and Jesus. This story is taken entirely from the book of Ruth and all quotes are from the ESV. First thing you learn about Boaz is he’s “worthy”. He owns his own land and has numerous men working under him whose respect he commands. This is a man of status and wealth. It’s established here that she’s much younger than him, young enough to be his daughter. Being married 10 years, she’s probably in her mid-late 20’s (they married young back then). So he’s probably, at least in his 40’s. Jewish tradition puts Boaz in his 80’s and Ruth in her 40’s. Either way, remember that she’s a lot younger than him. Let your eyes be on the field that they are reaping, and go after them. Have I not charged the young men not to touch you? And when you are thirsty, go to the vessels and drink what the young men have drawn. So, he has a number of young men and young women working under him. He is confident enough in the respect the young men have in him that he doesn’t give a second thought that they will obey his orders not to harass her. He definitely has honour in full. He’s very generous to her, why? Because she’s been loyal to his kin. Good female beta traits in her and good filial loyalty in him. He shares his wealth, but mostly hides it from her. He’s not doing it to buy her affection, but simply out of the goodness of his heart. A bit beta, but not supplication. This is important. A kinsman-redeemer refers to a close relative who takes on a number of duties for his kinsman, one of which was marrying the wife of of his kinsmen to continue his family line for him. So right here, Ruth’s being alerted that he’s available for marriage. So, here he is 40+, possibly 80, lying down to protect his grain; even in his old age (40 was a lot more back than than it is today) he stills strong enough to do his own dirty work to protect his property. This was a man of Strength. While sated and protecting his crops, a women comes to him with clear intent. Some interpreters take the “lie at his feet” to mean “got into bed with” and “spread your wings” as “take me now” (more or less), but even without this highly sexual interpretation, he is obviously being seduced by a “worthy” women half his age in the most unsubtle manner possible. That’s alpha. Now, he lets a little bit of beta frame slip from him here, with his “kindness” and “young man” remark, but he follows it up with a disqualifier, so he’s running some natural, mild push-pull game here. Again, a high display of honour here. Sitting at the gate was for Jewish elders and being able to do so was a great honour. Boaz had some rep. He convinces the man to not only forgo a new wife, but also to forgo taking some new property. He gets both a wife and some land out of the deal. A shrewd businessman; a master at his trade. Rather virile for his age. C’est non? The Lord rewards him by making him the forefather of the future house of the kings of Israel and of Jesus himself. Not bad. Once again, a hero of the Bible demonstrates the masculine virtues and alphaness to the glory of God and himself. He lands a worthy gal half his age, fathers a lasting house, and becomes renowned.